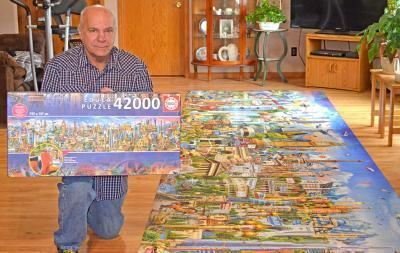 Clarence Mikolichek recently completed the assembly of a 42,000-piece puzzle at his home in Silver Lake. The puzzle covers much of the floor space in his house’s living room and kitchen. Mikolichek completed a 32,000-piece puzzle in 2015, an effort he thought might be his last puzzle project. “I thought the last one was going to be it. I wasn’t going to make any more big ones,” Clarence Mikolichek said, looking over a 5-foot wide, 24-foot long, 42,000- piece puzzle he’d just completed. The puzzle he started in October was assembled after the big puzzle he completed in 2015 -- a puzzle Mikolichek vowed would be his last puzzle project. It takes a combined effort: Mikolichek, Silver Lake, expended patience, fortitude, time and energy; his wife, Melinda, on the other hand, just needed a lot of patience. The 24-foot long puzzle forced the Mikolicheks to move tables and chairs around the massive puzzle. When he put together his last puzzle in 2015, a 32,000-piecer, it only took up most of the living room. “Now, (Melinda) lost the kitchen, too,” he laughed. Mikolichek averaged, over a three-and-a-half month period, a little over eight hours per day, seven days per week working on the largest commercial puzzle available on the market. The puzzle was a Father’s Day present from his son, Heath, and cost over $300. When spectators come to visit, they walk in and can hardly say anything but, “Wow!” Mikolicheck said. After working 35 years in construction, Mikolichek said he'd had some experience putting things together. During winter months, when construction work was slow, he drew back to past experiences with puzzles, noting his fascination with putting them together. He would get his mind off work by doing puzzles. “If I got a puzzle, I’ll make it,” Mikolichek said. And he’s methodical.